Jared Shank, the transfer articulation coordinator, helps students of diverse backgrounds succeed at Wright State. It’s no wonder Jared Shank, Wright State University’s transfer articulation coordinator, received the Tom Vandermeulen Award from the Ohio Transfer Council. The award, presented to Shank at the council’s annual conference, recognizes an individual whose contributions have led to the enhancement of relations among people of diverse cultures, ethnic groups, first generation college students or students with special needs. As an Army veteran who served in Afghanistan, Shank is well suited to support students of diverse backgrounds. “By reaching out to diverse populations, we are enhancing the experience of our graduates so that they can be thrown into any circumstance or setting and not only excel, but create synergy,” Shank said. “It’s great to see recognition for Jared’s work on behalf of transfer students, especially our veterans, but it’s only the beginning,” said Joe Law, Ph.D., assistant vice president for articulation and transfer. Shank is currently a member of the Military Strategic Implementation Team formed by the Ohio Board of Regents to implement the requirements of HB 488. Shank has previously served as tri-chair of the Veteran and Military-Connected Committee at Wright State and actively assists the Veteran and Military Center with military transfer credit issues. “I believe in WSU’s mission to produce graduates that have a solid foundation of success and scholarly research who will engage in service and work to revitalize the region,” he said. 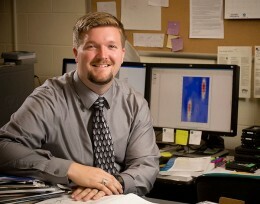 Shank earned his bachelor’s degree in geography from Wright State in 2009 and his master’s degree in earth and environmental science in 2013. The Ohio Transfer Council is committed to the enhancement and facilitation of transfer for students between and among its member institutions through sharing of data and ideas, fostering a better understanding of articulation and transfer policies, as well as member networking and professional development. The Vandermeulen Award was one of three awards presented at the May 30 conference at Columbus State Community College.